Ditch the car and get on an EVO e-bike! It’s fun to ride, cheap to run, environmentally friendly, offers exercise at a level you can control and is practical for all those short trips. 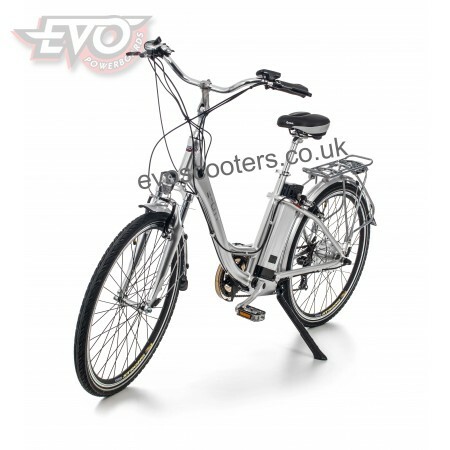 Presented in EVO Powerbikes’ signature polished aluminium frame, the stylish EvoMotion E-City electric bike offers stunning looks as well as an impressive specification. 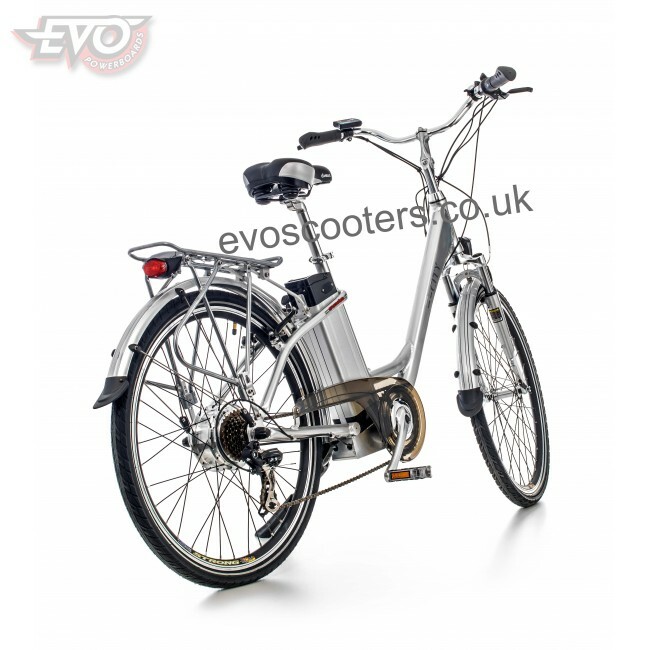 Not to be confused with the morass of lower quality products of dubious provenance, the EVO range of electric bikes is manufactured by the World’s leading electric vehicle manufacturer in compliance with EN15194, the EU directive covering electric bikes. 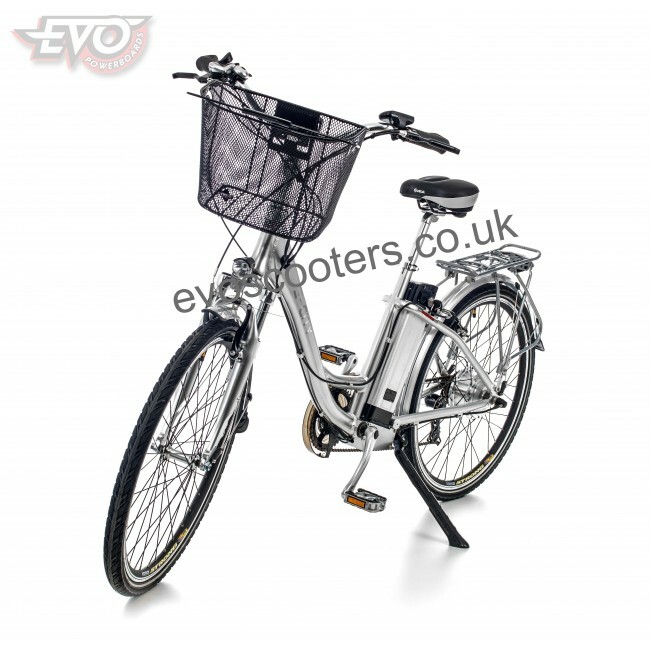 Fitted as standard with a powerful 36V 10Ah MnNiCo ternary lithium battery weighing just 3Kg, the E-City can travel up to 70Km (depending on load, terrain, conditions etc.) between charges in pedal-assist model. 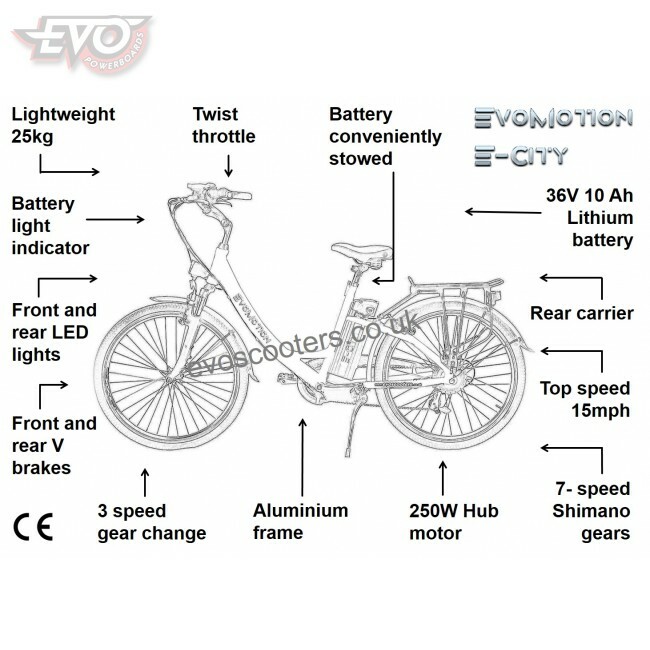 The latest advanced technology MnNiCo ternary lithium polymer batteries have been selected for the EVO range of electric bikes as, in addition to their super lightweight construction, high power density and being safer than other technologies, they provide an exceptional nominal 600 cycles. 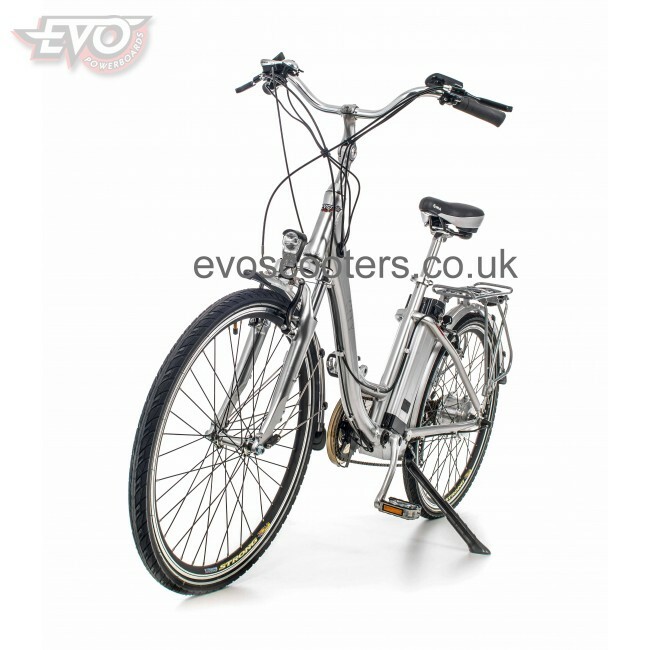 At only 25Kg plus the battery, the E-City is lightweight and easy to lift for ease of transport and storage. Because the battery is stored behind the upright of the frame, it allows use of the rear rack for carrying bags, fitting paniers etc. A powerful 250W 36V hub motor, coupled with 3 power-assist speed settings, provides plenty of power to the wheels. Hub motor technology has the advantage of reduced noise and, equally importantly, the direct drive means that there is no loss of energy via a chain - all the power goes to the drive wheel. 3. 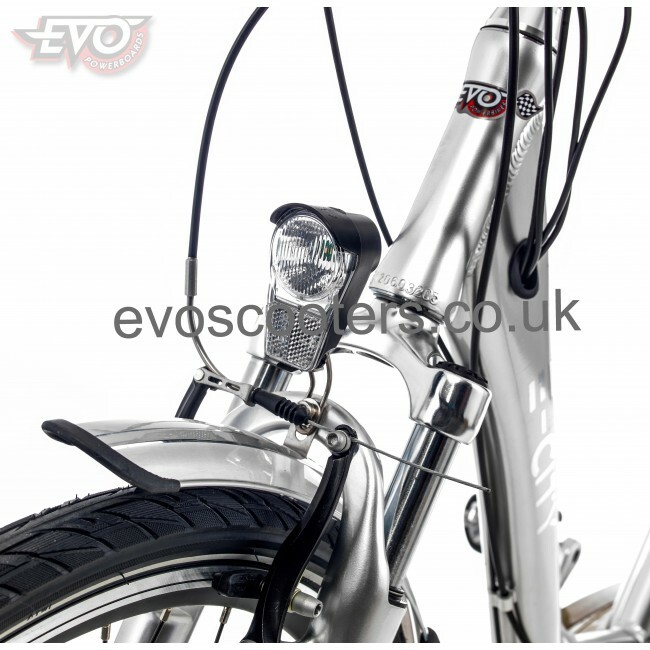 Motor power only – without pedalling, mainly for use on flat surfaces. In Mode 3, with a choice of 3 PAS speed settings, you can simply cruise without pedalling using the easy twist throttle. With a top speed of 15mph (depending on load, terrain, conditions etc.) this hybrid electric bicycle will get you to your destination fast. 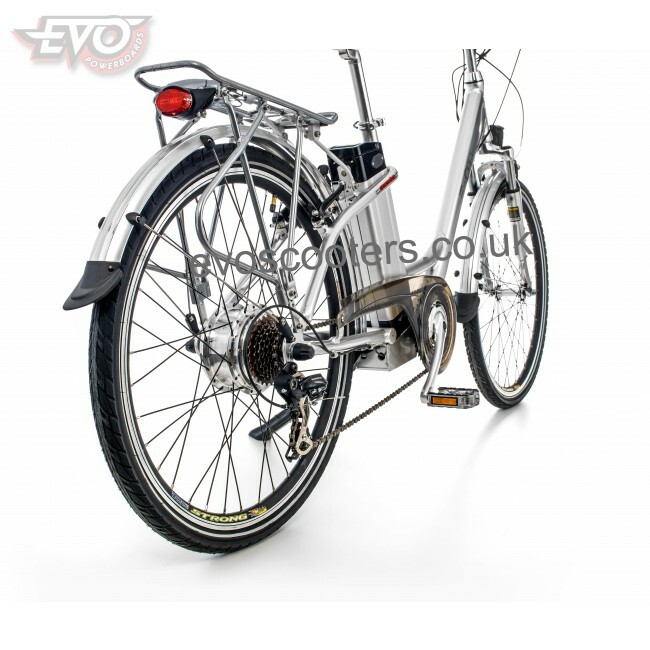 The comprehensive list of features is complemented by front and rear lights, a display showing mode and battery power, Shimano 7-speed gears and V brakes front and rear. Spares are available for this product. Please see our other listing for the basket. Size : 160 x 38 x 100cm approx. 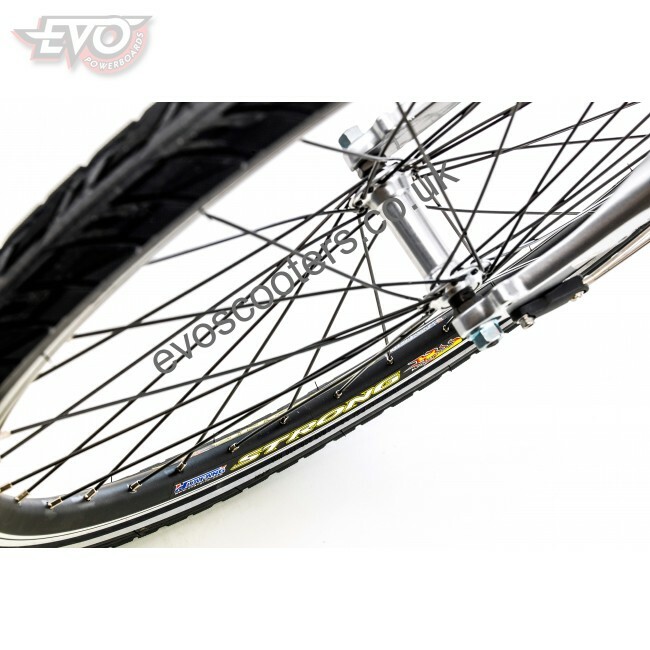 The maximum user weight is 120Kg. Buyers are advised to observe all safety warnings and rules for safe riding as set out in the Owner's Manual. The battery should be charged for 6 - 8 hours before first time use. 12 month motor warranty - details available upon request or on website.